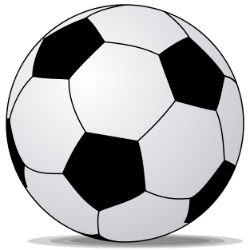 Learning how to kick a soccer ball with power and accuracy is a much more difficult skill than most people first realise. Especially when the soccer ball you're attempting to kick is flying at you during the middle of a game or bobbling uncertainly along the ground. If you have never had coaching before, even approaching the ball for the first time can be a bit of a challenge. Learning how to kick a soccer ball is one of the most fundamental (and fun) parts of playing the beautiful game. Striking a ball with power and precision or calmly stroking the perfect throughball to a teammate sprinting past their defender is a thing of beauty for the player who kicks it and those watching from the sidelines. With practice, hard work, and if you follow the 10 steps below, you'll be able to do this too. Making sure that you are prepared to receive the ball is a large part of setting yourself up to actually kick it. 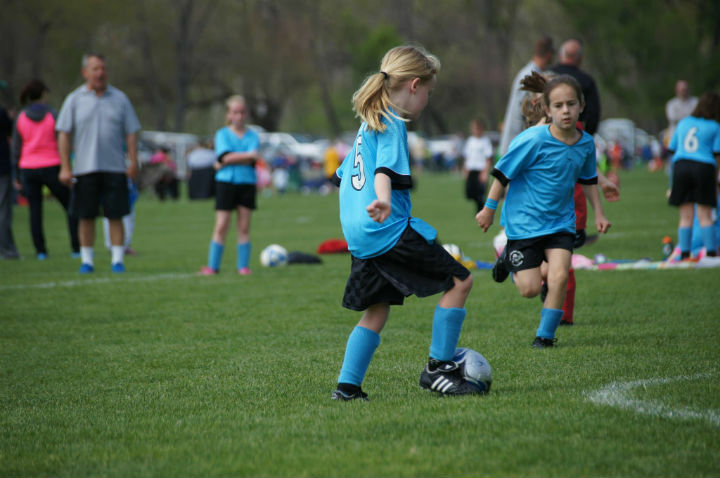 By being alert to your surroundings and other players, a player can decide early on what they plan to do with the soccer ball once they receive it. Being able to read the situation quickly will tell a player how long they'll have the ball, whether any teammates are open, or if they're in position to take a shot on goal. This preparation will all go a long way to ensuring a successful kick. Your first touch is very important and goes a long way to determining the accuracy and power of your kick. 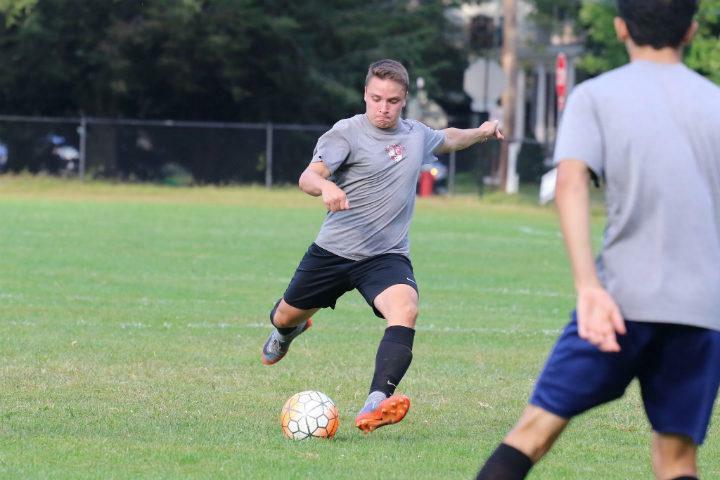 When you receive the ball, control it with your first touch and set yourself up for a great pass or shot. This means that the ball should end up a few feet away from you so that you can reach it in one step before striking the ball. If the ball is too close, you lose power and accuracy. If the ball is too far away, you're forced to stretch to even make contact. How you set yourself up is one of the most crucial aspects of kicking the ball well. Having correctly followed steps 1 and 2, you should know your target, have an idea of where everyone is on the pitch, and the ball should be sitting nicely in front you. Next up - keeping your eyes on the ball! Knowing what you need to do to get the ball to your intended teammate or into the back of the net, drop your eyes to the ball following a scan of the pitch. This will greatly help to increase your accuracy and make sure that you hit the ball in the right place and hopefully to the correct target! The next step involves firmly planting your foot next to the ball. This is the foot you use to stand on for balance - not your kicking foot. If done correctly, the placement of this foot (along with keeping your eyes on the ball) will help with your accuracy and power. Your foot should be planted on the side of the ball but must not be too close to it otherwise you will not be able to pass accurately. Also, your standing foot should also be pointed in the direction of where you want the ball to go when you strike it. How far you draw your kicking leg back will be determined by how much power you need to put into kicking the soccer ball. When winding up to shoot, for example, you should draw your leg back while bending at the knee until a V shape is created to help you generate a lot of power. For a simple short pass, however, you will only need to draw your leg back a short way to generate enough power to kick to your target. With time all players will learn how much power they need on each kick. When setting yourself up to pass or shoot, by planting your foot and running up to strike the ball, you should find that your body naturally molds itself into a comfortable shape. When moving your kicking leg towards the ball, your arms will naturally fly out to help you keep your balance. This will also help you to generate more power in your kick because your body will be working as one unit, rather than the swing of your arms counteracting your kicking technique. The arm on the side of your planted foot will naturally rise upwards while the other will fall backwards in sync with your kicking foot winding up to strike. By relaxing your body and allowing it to move naturally, you help to control your kick by not forcing your body to do something that doesn't feel right. In most cases, the ball will go in the direction that your body is pointed at. This means you must angle your body in the direction of your target and understand that it's very hard to get the ball to its intended desitnation if you're facing the wrong way. This is because its difficult to control flight and accuracy of the ball if different parts of your body are fighting against each other. Just like how you will lose power and accuracy if you're standing too close to the ball, you will also lose power and accuracy if your body is not positioned correctly. ​Step #8 - Kick the ball! Having followed the earlier steps, you should now be in a great position to kick the ball with accuracy and power. But what part of your foot should you use to kick and where should your kick land on the ball? Both of these things depend on what you are hoping to achieve. For a powerful shot on goal, with your leg back in a V shape and your body angled at the target, strike the ball with the laces of your boot. The large bone in your foot just after your big toe will act almost as a club and propel the ball forcefully towards the goal. For maximum power, you want to strike the ball in its centre, so not too near to the ground. If you want to put some spin on the ball or to curve it into the back of the net, then you simply strike the ball to either side of its centre depending on which way you would like it to go. A regular pass, however, will require a different technique as it is often unnecessary to strike the ball with maximum power. In this case, players should use the inside of their foot which is generally more accurate but less powerful. Your body's momentum should naturally follow the ball after you've made contact and kicked the ball. For example, if you're attempting a powerful strike, your kicking leg will fly up in the air after you've struck the ball. To help improve your shooting accuracy, you need to let that happen as naturally as possible because stopping abruptly can disrupt your kick. You will also find that the rest of your body will move naturally with your shot. For example, the arm on the shooting side of your body will come forward in sync with your kicking foot. Your follow-through also helps decide where the ball ends up. If you let your foot rise higher then the ball too should go higher into the air. To keep the ball from flying into the air, however, you will want to limit how far your striking foot rises. Before continuing on with your game, make sure to land on your kicking leg and you are good to go! ​Step #10 - Don't stop – keep playing! Once you've passed the ball on, don't forget to move and look for new spaces to exploit while preparing to receive a pass again. If you've just taken a shot, don't remain static and watch the flight of the ball, move into a new position or follow the ball in case the keeper parries it or the ball deflects off a defender. 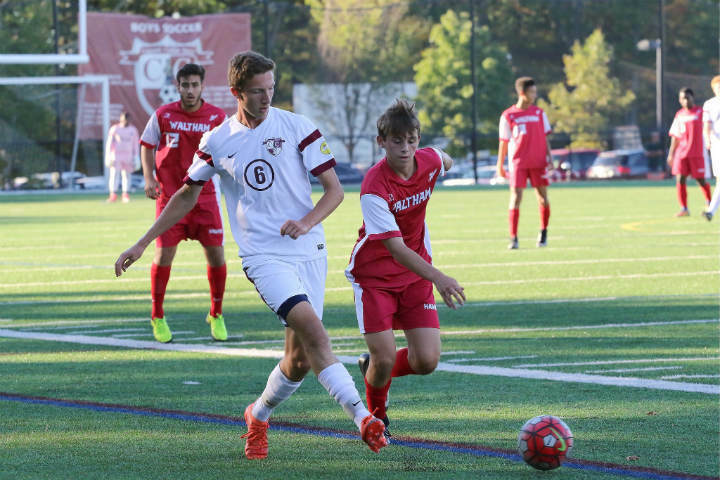 With constant movement and staying alert, you can put yourself in position to receive a pass back from a teammate or slot in a deflected shot on goal. What are some advanced ways that players may choose to strike the ball? Here, the player wants to make a long pass to one of their teammates which will cover a long distance. The best way to make this pass is through the air. This time when striking the ball, the player should position their foot at the lowest point on the soccer ball. This ensures that when contact is made, the ball will fly up in the air and over your opponents. 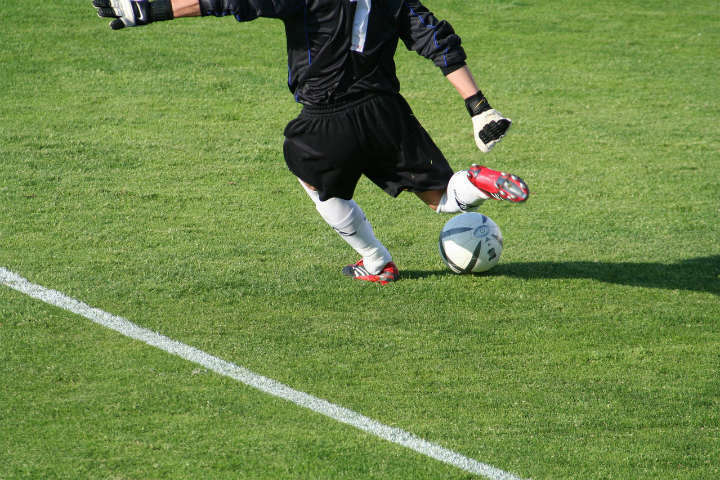 When trying to curve the ball around the keeper, the player must strike the ball with the interior of their foot and not with their laces. By making contact on the correct angle and with a good amount of power, a player can get spin on the ball and curve it around the keeper or the freekick wall. Make sure to practice these as it's an advanced kick! Rarely used in comparison with other passing or shooting techniques, the outside of the foot pass is lovely to watch when executed to perfection. The player kicks the soccer ball with the exterior (outside) of their foot and instead of landing on their kicking foot, usually skip forward due to their momentum, landing again on their standing foot. To get the soccer ball up and over the keeper before landing in the back of the net, the player must perform a chip shot. To do this they kick the underside of the ball and barely follow through if at all. This makes the ball jump into the air over a short distance before coming quickly back down to earth. Rarely used in 11-a-side soccer, the toe punt is the most popular way of shooting in futsal as it generates a lot of power and a venomous, unpredictable swerve. In comparison to the other shooting techniques where you use the interior and exterior of your boot or the laces, the toe punt is executed with the tip of your boot where your toes are. This is useful if you are being followed by a defender and don´t have time to wind up for a regular shot. The toe punt is performed quickly and the result is usually faily inaccurate as you sacrifice accuracy for speed. Don't stop – keep playing! 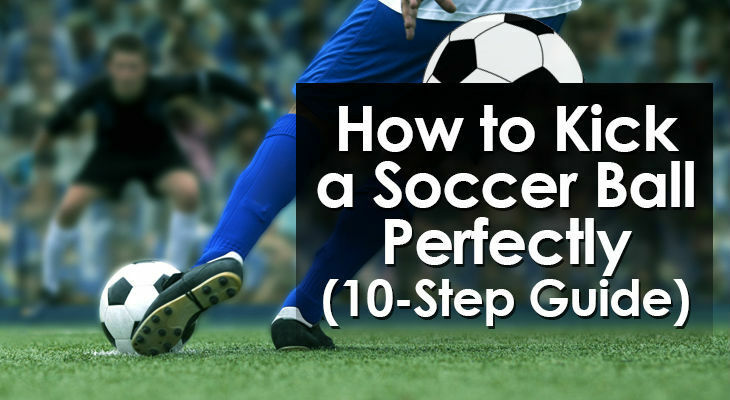 A ten-step guide on how to kick a soccer ball both powerfully and accurately (and also some advanced kicking techniques). Each step will help you to move the ball around the pitch confidently and with ease. Also, make sure you're practicing all steps with both your right and your left foot. If you want to advance to a higher level in soccer, you must be able to execute passes and shots with both feet. As they say, practice makes perfect so it’s time to take to the field and start working on your kick!